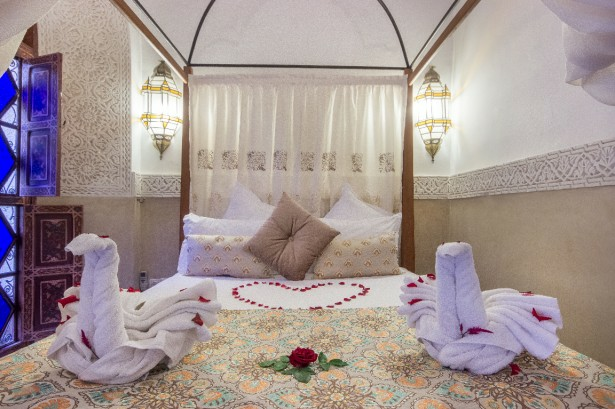 The Riad Melhoun & SPA is located in the heart of the ancient ocher city and its effervescence, in a very famous district of Marrakech, between the Palace of La Bahia and the museum Dar Si Said and only 5 minutes walk from the mythical place Jamaa El Fna. 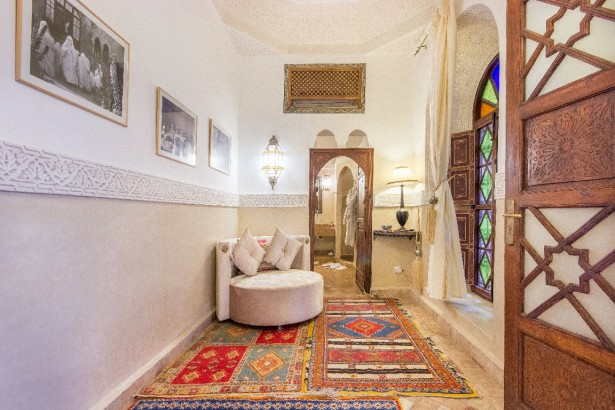 The Riad Melhoun & SPA has been recently and completely renovated. 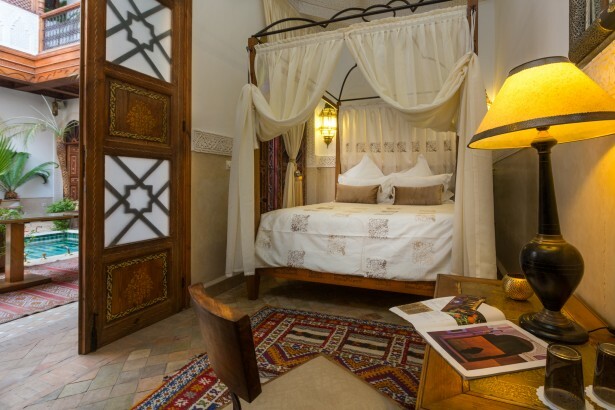 The architecture of our Riad and its decoration are inspired by different palaces and traditional houses of Marrakech. The best maâlems (craftsmen) participated in the sculptures of the wooden and plaster elements of Riad Melhoun & SPA. Two of the facades of the patio, vis-à-vis, are dressed with wooden moucharabiehs and carved plaster, the other two have structures with columns and wooden arches. 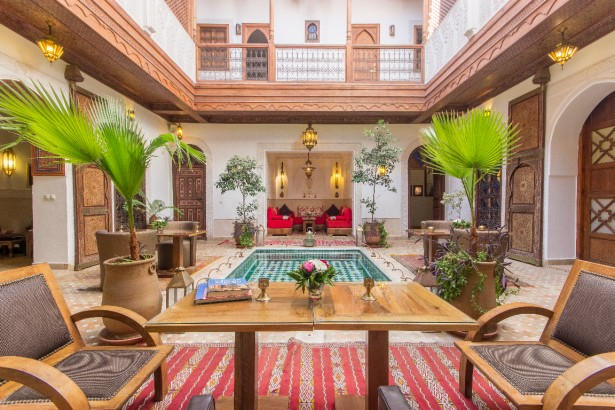 The ceilings of the corridors, the doors and windows of the rooms are in painted wood (Zouak) with patterns in arabesques, raised in the palace of La Bahia. 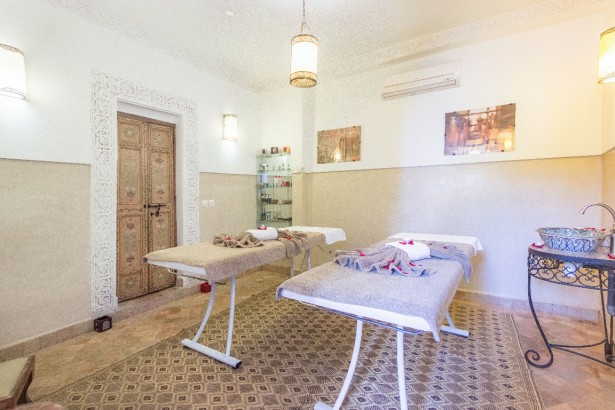 Privatization of Riad Melhoun & SPA You will also have the opportunity to Privatize our Riad (from 2 to 18 people) for all your events (Anniversary, family reunion, Team Building, Insentive etc ..). Contact us directly. You can cool off in our beautiful swimming pool (4 m/3m) which is strongly inspired by the pool of the Medersa Ben Youssef. 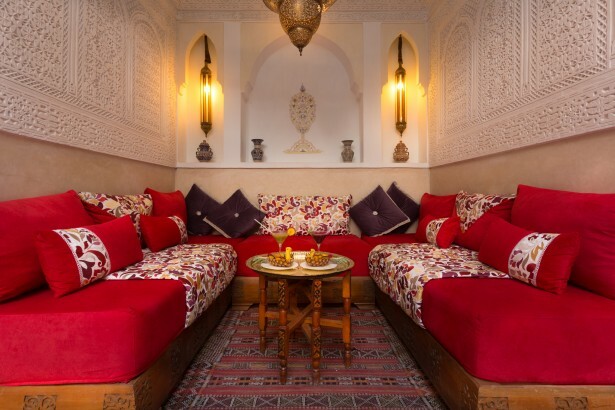 You will discover several lounges open one with its library, its alcove and these armchairs, offering a reading and privacy space, and finally another air-conditioned lounge, with its Moroccan sofas, providing a space for meeting and relaxation. 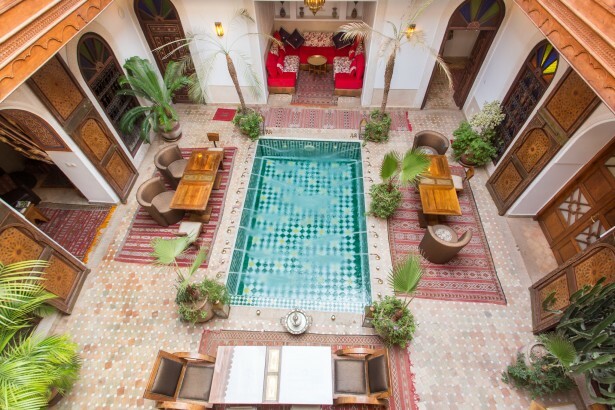 You will find in our Patio a magnificent pool inspired by the pool of Medersa Ben Youssef. An open living room. Sunbeds for sunbathing and relaxing around our pool. 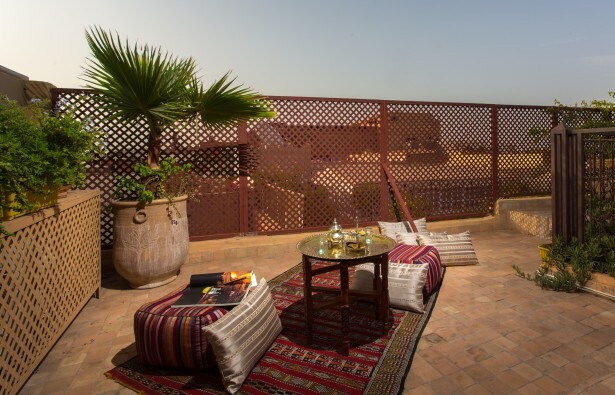 Our Private Terrace with a breathtaking view of the Medina of Marrakech and the Atlas Mountains. You can have breakfast, lunch and dinner if you wish. You can relax with a glass of mint tea or just take a stroll. 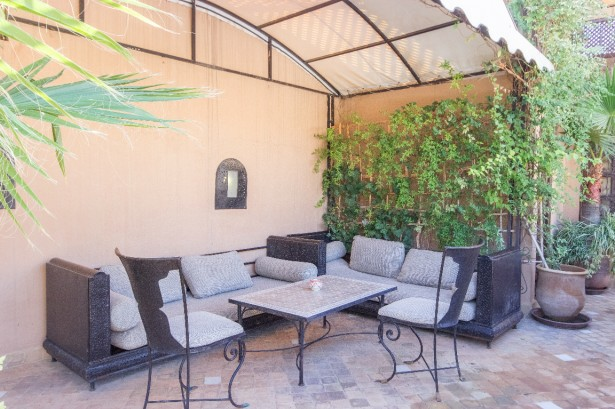 In addition, you will find on our private terrace a dedicated area (solarium) to the fan of tanning. With 300 days of sunshine Marrakech is the perfect city. A hanging garden integrates in its green setting enclosures of conviviality and relaxation, sheltered as open for a sunbath. 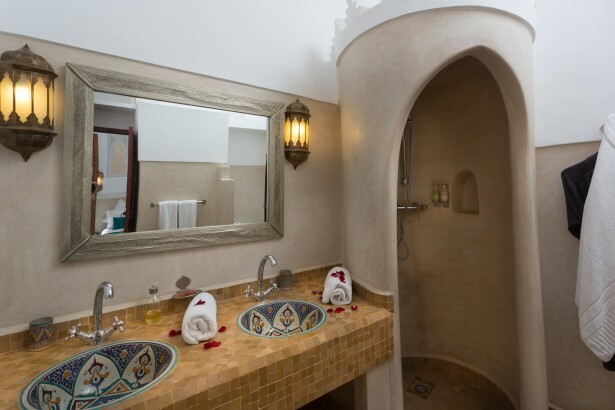 2 Deluxe Suites, 3 Deluxe Rooms and 3 Standard Rooms all equipped with: All the rooms have private Bathrooms. 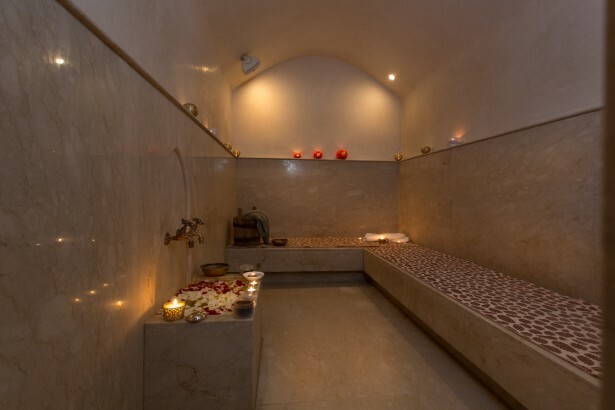 Spa: We have a Hammam and Massage room at the riad.